Deep-South discloses a Preliminary Economic Assessment, NPV: CA $895 million, Pre-Tax IRR: 30.4% at a price of Copper of US $3.00 per lbs, on the Haib Copper Project in Namibia. Vancouver, B.C., Canada – February 26, 2018 – Deep-South Resources Inc. ("Deep-South" or “the Company") (TSX-V: DSM) today announced that it has received the results of a Preliminary Economic Assessment ("PEA") from Mineral Engineering and Technical Services of Australia (“METS”) on its Haib Copper project in Namibia. "By going with heap leach treatment and sorting technologies, we have been able to provide low capital cost and operating costs and, equally as important, reduce the environmental footprint of the project," said Pierre Léveillé, President & CEO of Deep-South. "The PEA proposes a robust economic return that we expect to enhance during the PFS stage." Option 1: Ore sorter upgrading, dense media upgrading, flotation and heap leaching of the tails. Option 2: Two-stage dense media upgrading, flotation and heap leaching of the tails. Option 3: Ore sorter upgrading and heap leaching of the upgraded material. Option 4: Whole ore heap leaching. Options 3 & 4 have shown better economic figures, despite option 3 having a relatively low copper recovery compared to the other options as the use of ore sorting technology has the benefit of reducing the downstream capital requirements. Those two options will be the object of further testwork and a Pre-Feasibility Study (“PFS”). Option 3 is the case presented in this press release. METS believes a ramp up to 20 Mtpa as the project is nearing positive cash flow will increase the financial viability. METS have developed a scenario which focuses on option 3 – the best economic option in terms of IRR – in assessing the impact of increasing the scale of the project. The assessment looks at beginning the project at 20 Mtpa, however it is recommended to stage the expansion over a number of years (e.g. start at 8.5 Mtpa, increase to 10 Mtpa and then increase to 20 Mtpa for instance). The following table outlines the key economic outcomes for the larger throughput scenario (using the base case figures – e.g. $3.00/lb copper price). A throughput optimisation study should be performed once a final process design has been selected. For the recovery of copper from the Haib deposit, heap leaching was considered for all options. The primary reasons for the selection of heap leaching is the low grade nature of the deposit and the vast scale of the orebody. Previous work conducted on the Haib project suggests that a conventional crush-grind-float and sale of copper concentrate is not economically feasible due to the low grade and hardness of the ore – requiring a significant amount of energy for grinding. The low costs associated with heap leaching compared to a whole ore flotation circuit is believed to improve the viability of the project. Heap leaching is traditionally performed on oxide material, although there has been increasing development in the application to acid insoluble sulfides. Previous sighter amenability testwork, carried out by Mintek, METS and SGS South Africa, suggests the Haib material can extract high amounts of copper, up to 95.2% via a bacterial assisted leaching, although additional testwork is required to determine the optimal operating parameters. Given these results there is no reason to suggest the chalcopyrite in the Haib deposit will not be amenable to bacterial assisted heap leaching. The system design proposed will use 3 crushers and an ore sorting system (either on the primary crushed product or the secondary crushed product depending on the technology selected) that will provide higher grade ore to the heaps. The primary crusher will reduce the rock to 127 mm (gyratory crusher), the secondary crusher to 32 mm (cone crusher) and the tertiary crusher to 5 mm (HPGR). The process is designed for a 90% availability, processing over 23,000 tonnes of ore per day (at the 8.5 Mtpa scenario) at a strip ratio of waste:ore of 2:1. 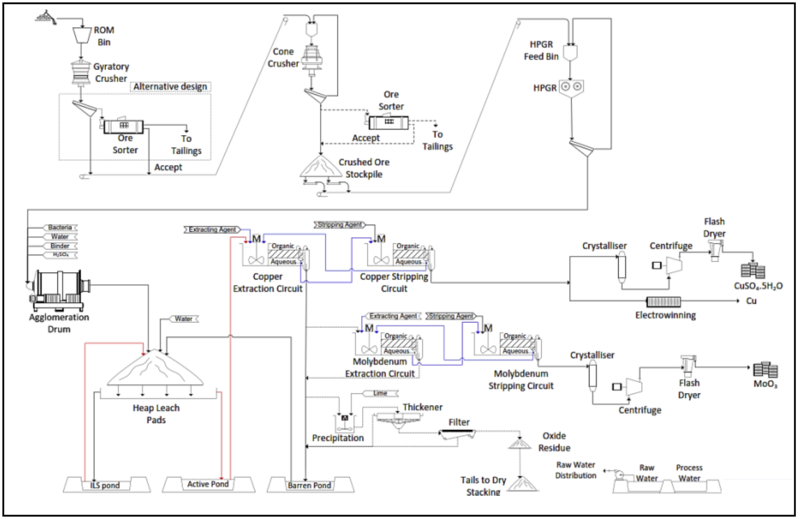 Molybdenum recovery has been considered for the flowsheet design, although no operating expense, capital expense or revenue has been considered for the economic analysis. The economics of the molybdenum will be assessed once it is included in the indicated resource. An indicated resource of 456.9 Mt at 0.31% copper at an annual throughput of 8.5 Mtpa would correspond to a 55 year project life. Due to the long project life, it is suggested to start at 8.5 Mtpa and operate at this throughput for approximately 3 years and then execute staged expansions to eventually ramp up to 20 Mtpa, ultimately shortening the project life. As the resource expands and the inferred resource progresses towards measured, then additional expansion to possibly 40+ Mtpa should be assessed. All flowsheets, mass balances, design criteria and equipment lists are based on an 8.5 Mtpa throughput; although financial components have been scaled to provide estimates for the higher throughput scenario. The PEA technical report will be filed on SEDAR at www.sedar.com and on the Deep-South website at www.deepsouthresources.com shortly after the issuance of this news release. The Haib deposit is located within part of the Namaqua-Natal Province called the Richtersveld geological sub-province which is further subdivided into a volcano-sedimentary sequence (locally, the Haib Subgroup), the Orange River Group and the intrusive Vioolsdrift suite which are closely related in space and time. The principal mineralised hosts at the Haib are a Quartz Feldspar Porphyry (QFP) and a Feldspar Porphyry (FP). The Haib deposit is in essence a very large volume of rock containing copper mineralization. The grade is variable from higher grade in the three core zones progressively dropping towards the margin of the deposit. The principal sulphides within the Haib body are pyrite and chalcopyrite with minor molybdenite, bornite, digenite, chalcocite and covellite. The mineral resources for the Haib Copper Project were estimated by Dean Richards of Obsidian Consulting Services, supervidsed by Peter Walker of P & E Walker Consultancy, both independent Qualified Persons as defined by NI 43-101 and were reported in a news release dated January 16, 2018 but are summarized below for convenience. Readers should review that news release for additional information or read the full report that can be viewed on our web site at: www.deepsouthresources.com or on the SEDAR web site at: www.sedar.com. 1- Dean Richards of Obsidian Consulting Services, a Member of the Geological Society of South Africa and Professional Natural Scientist (Pr. Sci. Nat) with the South African Council for Natural Scientific Professions (SACNASP), estimated the Mineral Resources under the supervision of Peter Walker of P & E Walker Consultancy, both of whom are the Qualified Persons for the Mineral Resource Estimates. The effective date of the estimate is January 15, 2018. Mineral Resources are estimated using the CIM Definition Standards for Mineral Resources and Reserves (2014). 2- Reported Mineral Resources contain no allowances for hanging wall or footwall contact boundary loss and dilution. No mining recovery has been applied. This Haib Copper Mineral Resource has been defined by diamond core drilling covering a total surface area of some 2.6 square kilometres. The mineral resource classification is closely related to data proximity. Topographic elevations within the mineral resource area vary from 320m to 640m above mean sea level and average 480m above mean sea level. Indicated resources are constrained between the variable topographic surface and a horizontal level which is 75m above mean sea level and within which the majority of the drill and assay data are constrained. Inferred resources are laterally constrained by the last line of drill holes and extend vertically from the horizontal surfaces defined by the +75m and -350m above mean sea level ( a block of 425m thickness) within which there is a lesser data set derived from drilling. Mineral Resources that are not mineral reserves do not have demonstrated economic viability. Mineral resource estimates do not account for mineability, selectivity, mining loss and dilution. These mineral resource estimates ar based on Indicated Mineral Resources that are considered too speculative geologically to have the economic considerations applied to them that would enable them to be categorized as mineral reserves. However, there is no certainty that these indicated mineral resources will be converted to measured categories through further drilling, or into mineral reserves, once economic considerations are applied. There is no certainty that the preliminary economic assessment will be realized. The Haib Copper Deposit is a large sulphide ore deposit. Copper is mainly present as a sulphide in the form of chalcopyrite. Copper is also present as oxides (chrysocolla, plancheite, malachite and azurite), occurring as intrusions in shear zones. Initial testwork results showed that the Haib mineralisation is a competent quartz feldspar porphyry rock. It can be seen that the main ore is copper with only an accessory amount of molybdenum present. The chalcopyrite also occurs as occasional coarse irregular grains from 0.1 mm to 0.35 mm. Considering the Haib copper deposit characteristics, the suitable mine design is based on an open pit method. As the deposit is basically composed of hard rock material, the mining operations will involve drill and blast of all excavated material, which will be segregated by cut-off grade. The mining fleet considered being suitable for the Haib project would most likely consist of between 80 t and 120 t sized hydraulic excavators, off highway dump trucks with a capacity of between 65 t to 90 t, supported by standard open-cut drilling and auxiliary equipment. Option 1 and 2 will generate approximately 250 ktpa tonnes per annum of tailings from the flotation circuit. Due to environmental and water recovery considerations the tailings will undergo dry staking. All options include dry stacking of the iron oxide waste from the iron removal stage (250-500 ktpa depending on the process option). The remaining waste will either be from the ore sorter rejects or from the heap leach pads (~8 Mtpa) and will be coarse rock material. The heaps will remain in place and undergo periodic washing to ensure copper extraction is maximised. Washing will be stopped once the ore is considered ‘spent’. The ore sorter rejects and the spent ore can be disposed of in a manner that produces a suitably stable landform. Easier to close and rehabilitate. It is suggested to consider stockpiling the low-grade ore to process it at the end of mine life, in case the copper price increase considerable by the end of the mine life and/or a new mineral processing technology be created or developed. Direct capital costs were estimated at US $ 139.6 million, including off-site infrastructure. Indirect costs and a 10% contingency were estimated at US $ 52.2 million, which bring the initial capital cost to a total of US $ 191.8 million. Note: Mineral Resources that are not mineral reserves do not have demonstrated economic viability. Mineral resource estimates do not account for mineability, selectivity, mining loss and dilution. These mineral resource estimates are based on Indicated Mineral Resources that are considered too speculative geologically to have the economic considerations applied to them that would enable them to be categorized as mineral reserves. However, there is no certainty that these indicated mineral resources will be converted to measured categories through further drilling, or into mineral reserves, once economic considerations are applied. There is no certainty that the preliminary economic assessment will be realized. The design for each option as it stands involves the burning of sulphur to produce sulphuric acid. There are several possibilities for sulphuric acid sourcing, including purchasing from smelters within Namibia. Buying in sulphuric acid at the start of the project life and building a sulphur burning plant once the project is cash flow positive may provide a better economic scenario. This will allow for the sulphur burning plant capital to be deferred and the payback period to be shortened. 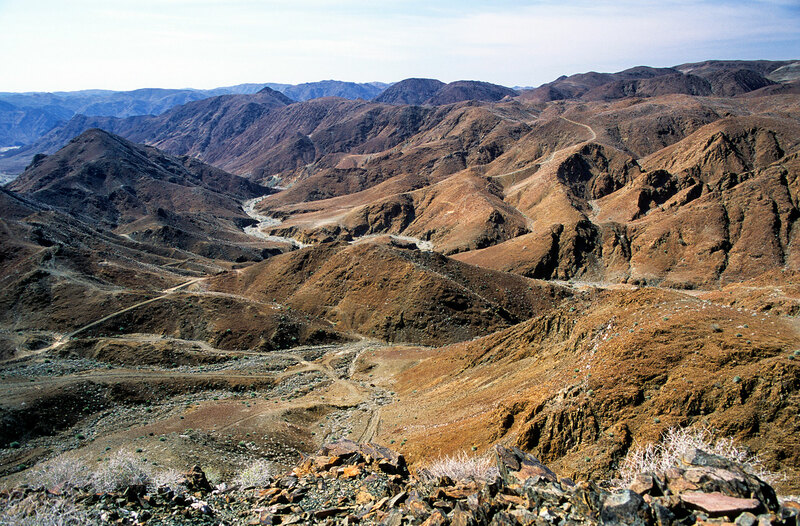 Aside from the usual risk associated with the advancement of a mineral project towards a production decision, such as metal prices, resource continuity, mineability, construction risk, capital and operating cost risk, the principal risk related to the Haib Copper Project is the confirmation of the heap leaching recovery and sorting technologies used in the PEA, which were based on preliminary testwork completed by University of Witwaterstrand, Mintek, METS and SGS South Africa. Additional testwork is required to confirm and potentially enhance the overall recovery performance of the project. 1- Insufficient metallurgical testwork has been undertaken. Solar Energy: Given the semi-arid climate of Namibia, a solar energy farm may be an option for reducing the unit cost of power. This will also have positive social impacts for the project, which is expected to have a long life. The resource tonnage allows for possible multiple expansion stages to be executed should the project proceed to once in production. A staged approach is recommended in order to de-risk the project by projecting that the project achieves positive cash flow prior to plant expansions. The results from the PEA have been promising, going forward METS recommends Deep-South Resources move to conduct a Pre-Feasibility Study (PFS) as the next phase of the project. The independent qualified persons for the Haib Copper PEA are Mr. Damian Connelly of Mineral Engineering and Technical Services, Mr. Peter Walker of P & E Walker Consultancy and Mr. Dean Richards of Obsidian Consulting Services. Obsidian Consulting Services conducted a review of the QA/QC programme implemented by Teck using the certificates of analysis received from Acme Labs and provided by Teck. This review compared the results of field duplicates, blanks as well as the various standards utilised with respect to Cu and Mo. The design of Teck's drilling programme, quality assurance / quality control programme and the interpretation of results were under the control of Teck's geological staff. The QA/QC programme is consistent with industry best practices. Drill core is logged and cut onsite, with half-core samples prepared at Analytical Laboratory Services, Windhoek, Namibia. Prepared samples are shipped to Acme Analytical Laboratories, Vancouver, Canada for appropriate base metal assaying and gold fire assaying techniques. All analytical batches contain appropriate blind standards, duplicates and blanks inserted at regular intervals to independently assess analytical accuracy and precision. Mr. Walker and Mr. Richards reviewed the sample chain-of-custody, quality-assurance and quality-control (QA/QC) procedures, and the accreditations of analytical laboratories used by Teck. The QPs are of the opinion that the procedures and QA/QC are acceptable to support Mineral Resource estimation. Mr. Walker also audited the assay database, core logging and geological interpretations and found no material issues with the data as a result of these audits. In the opinion of the QPs, the data verification programs undertaken on the geological and assay data collected from the Haib Copper support the geological interpretations and the analytical and database quality, and the data collected, can support Mineral Resource estimation. Damian E.G. Connelly, BSc (Applied Science), FAusIMM, CP (Met), Director of Mineral Engineering Technical Services is the main author of the Preliinary Economic Assessment report and is responsible for the technical part of this press release and is the designated Qualified Person under the terms of National Instrument 43-101. Peter Walker B.Sc. (Hons.) MBA Pr.Sci.Nat. of P & E Walker Consultancy is the main author of the 43-101 resource estimation report, and is a Qualified Person under the terms of National Instrument 43-101. Mr. Dean Richards Pr.Sci.Nat. , MGSSA – BSc. (Hons.) Geology, of Obsidian Consulting Services is the contributing author of the 43-101 resource estimation report and is a Qualified Person under the Terms of the National Instrument 43-101. Mineral Resources that are not mineral reserves do not have demonstrated economic viability. Mineral resource estimates do not account for mineability, selectivity, mining loss and dilution. These mineral resource estimates are based on Indicated Mineral Resources that are considered too speculative geologically to have the economic considerations applied to them that would enable them to be categorized as mineral reserves.. However, there is no certainty that these indicated mineral resources will be converted to measured categories through further drilling, or into mineral reserves, once economic considerations are applied. There is no certainty that the preliminary economic assessment will be realized. As well, all of the results of the 2018 Haib Copper preliminary economic assessment constitute forward-looking information, including estimates of internal rates of return, net present value, future production, estimates of cash cost, assumed long term price for copper of US$3.00 per pound, proposed mining plans and methods, mine life estimates, cash flow forecasts, metal recoveries, and estimates of capital and operating costs. Furthermore, with respect to this specific forward-looking information concerning the development of the Haib Copper Project, Deep-South Resources has based its assumptions and analysis on certain factors that are inherently uncertain. Uncertainties include among others: (i) the adequacy of infrastructure); (ii) unforeseen changes in geological characteristics; (iii) changes in the metallurgical characteristics of the mineralization; (iv) the ability to develop adequate processing capacity; (v) the price of copper; (vi) the availability of equipment and facilities necessary to complete development; (vii) the size of future processing plants and future mining rates, (viii) the cost of consumables and mining and processing equipment; (ix) unforeseen technological and engineering problems; (x) accidents or acts of sabotage or terrorism; (xi) currency fluctuations; (xii) changes in laws or regulations; (xiii) the availability and productivity of skilled labour; (xiv) the regulation of the mining industry by various governmental agencies; (xv) political factors, including political stability.